No, this is not part of one of the Chelsea show gardens. Since I have no photos of this year’s show, this is the next best thing to introduce this post. This is my “copy-cat” Chelsea border! You see the power of Chelsea flower show? This small stretch of my main herbaceous border, was inspired by Luciano Giubbelei’s show garden for Laurent-Perrier in 2011, which used a colour palette of pinks and bronzes, apparently reminiscent of rose champagne. This is its second year, and is filling out nicely – definitely all froth and fizz! 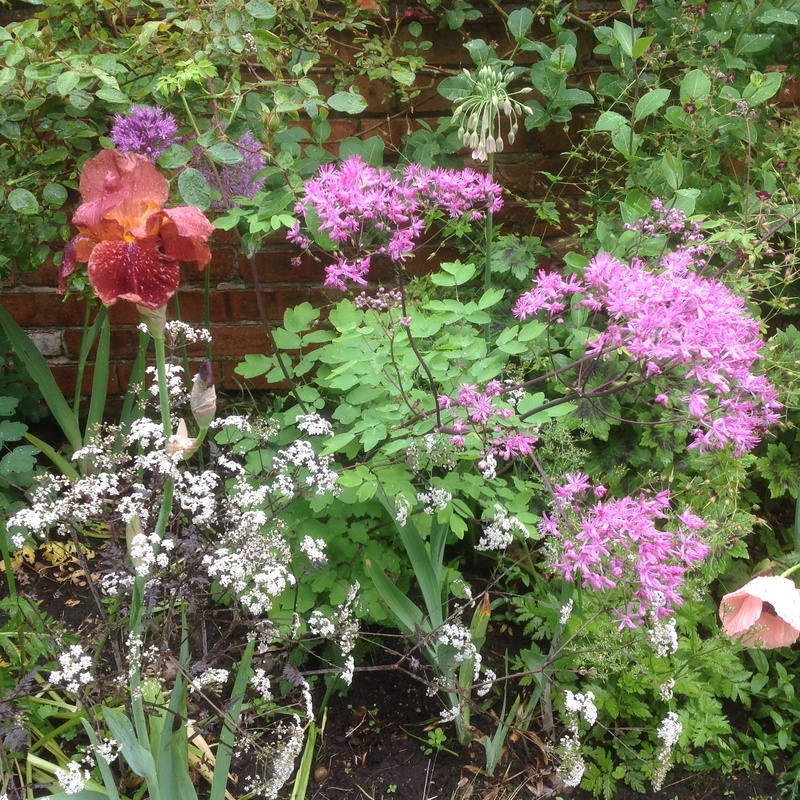 It has all the Chelsea hallmarks – cow parsley, bronze irises, floaty thalictrums and, of course, the purple alliums! Which leads me into this years show! As you can tell, I’m a huge fan of Luciano (I’m not name dropping, just shortening it – Giubbelei’s a nightmare to keep spelling! Sorry, Luciano!) I was drawn to his earlier gardens which I saw in magazines, and loved all the formality and straight lines – so minimalist and contemporary (though not for a plantsman!). Since he started showing at Chelsea, he has moved on from his all-green palette, and introduced flowers, which he does so well. This years garden, in my mind, was well worthy of “Best in show”. The pool, which is central to the design, is absolutely stunning. All his straight lines are still in evidence, with the steps in the pool and the adjoining rills. The planting, again in geometric blocks, really softens all the hard landscaping. And the colours are so soft and beautiful. The tree? Well, I can boast, I too have an Amelanchier! The colour scheme really moved away from the Chelsea norm. I loved the creamy whites and yellows, with only a hint of blue, for depth and contrast. And it was good to see lupins make such a statement, after years of obscurity. Which brings me on to my next view – that of the planting. I’m sure you’ll agree that there are always trends in Chelsea planting. One year it’s the strong shapes of purple alliums everywhere, the next it’s frothy cow parsley. I always believed that the designers were trying to “steer” gardening fashion. 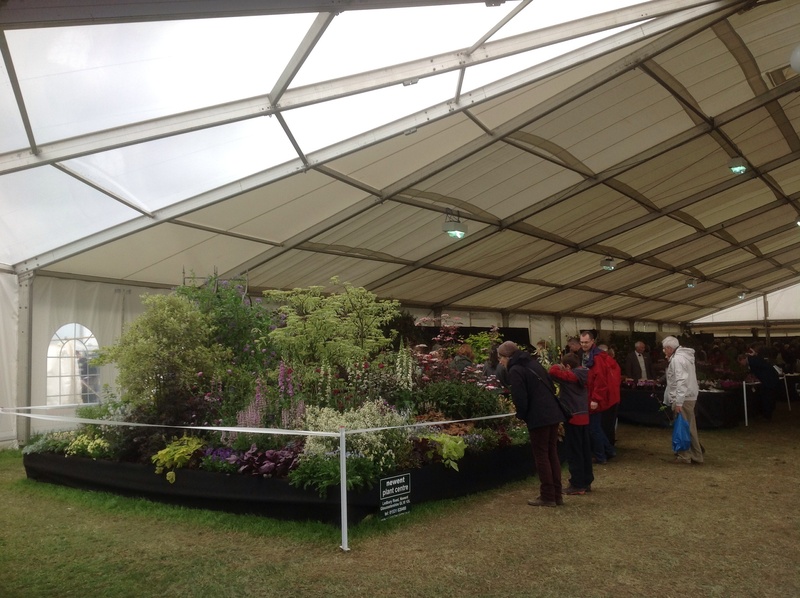 However, this year I have heard it mentioned, that it is more likely to be due to the limited number of plant suppliers to the show, dictating the plants available. That makes complete sense to me and could account for it. I also liked Cleve West’s M & G garden. I loved the modern take on the Paradise gardens of old, all offset by the adjacent wilder planting – the concept of a paradise from the wilderness. The Daily Telegraph garden was my other favourite, but it seemed to have mixed reports. Some saw it as too perfect and pristine, others saw it as too corporate. I was drawn to it, again, by its formality and straight lines. But the overwhelming factor that hit me, that seems to have produced little comment, was to see a lawn as the centrepiece of the garden for the first time in yonks! Ok, I agree that it was so pristine, that it would not stay like that for 5 minutes in the real world, and it would be high maintenance in this day and age. But didn’t it look wonderful? Although the garden is a very contemporary style, it’s also a very traditional layout. A central lawn, surrounded by borders, and a shaded patio area, complete with seating, water feature and potted plants. I can easily imagine it being a family garden, with a few daisies thrown in. And the box “cushions” at the corners were just so tactile! 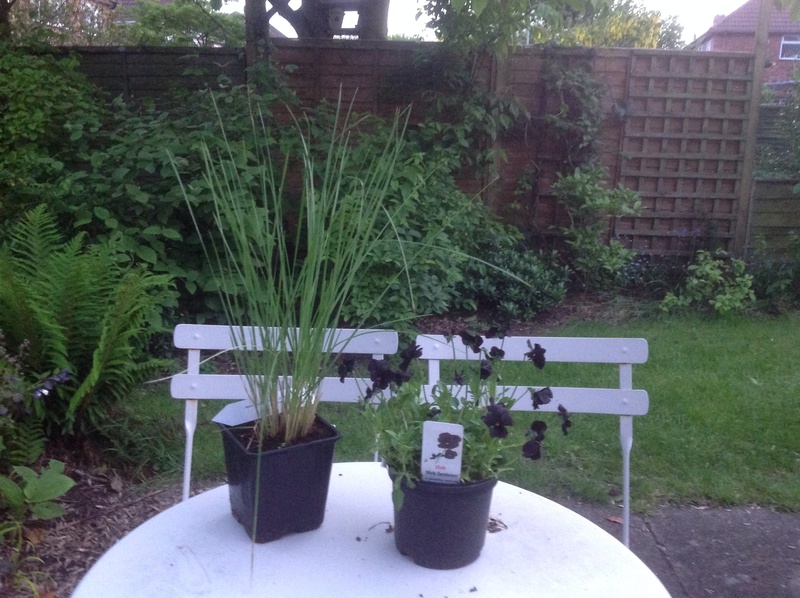 I found the whole garden very comfortable and usable – though I may be alone in thinking that! The gardens again, were totally inspirational. It was lovely too, to see the flush of new, young designers this year. Didn’t they do extremely well? Matt Keightly’s garden, “Hope on the Horizon” was beautiful, with its hard granite cubes among soft planting. No surprise it was the “People’s Choice”! And I want to finish with a few “buzz” words to some up this years trends – blue, plum, lupins. Oh, and if I hear the phrase “push the boundaries” again, before next May, you may well hear me scream! This entry was posted in Garden Design and tagged Chelsea flower show, Garden design, Luciano Giubbelei, show gardens on May 27, 2014 by thelonggardenpath. At last, it’s time for Malvern Spring Show, or Festival, as they have now re-named it! One of the highlights of our year! I say “all aboard” as it is an easy train journey for us and so that frees us up to sample some of the other delights of the show. We both love visiting all the show gardens, but when it comes to the floral marquee, “Mr. Chef” loses interest. So he heads off to the Food and Drink hall, which is more his “cup of tea”. Although it’s not tea he’s seeking out! They do have exhibitors of local beers and ciders. And it would be so rude not to keep him company! But first things, first – the show gardens! There were 9 show gardens (fewer than in previous years, as we recall), 4 festival gardens and many lovely little school gardens. This is where our future gardeners and designers lie. 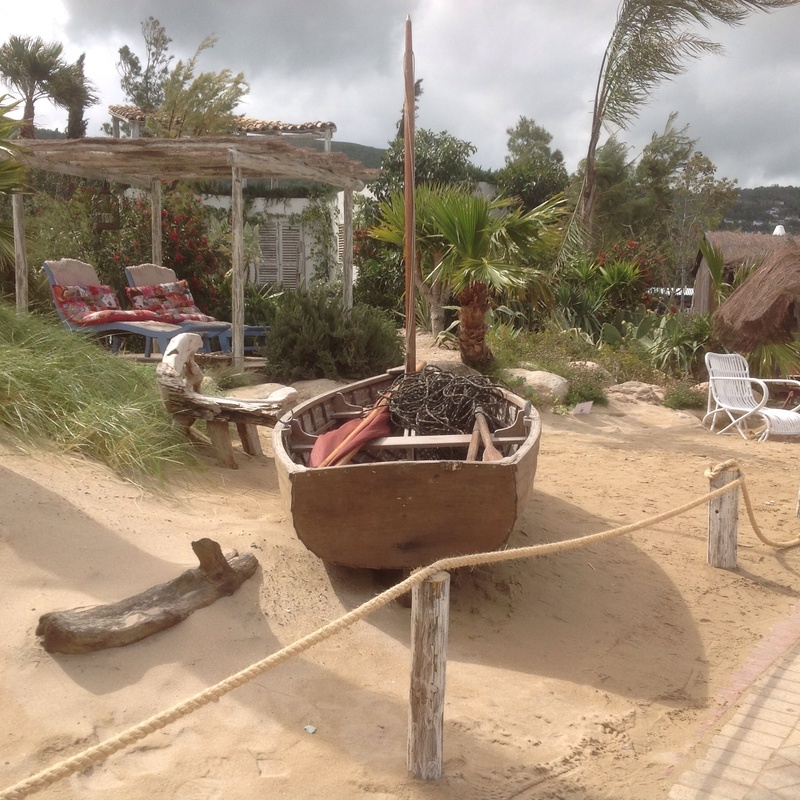 This was the “At Home on the Beach” garden by Villaggio Verde, the olive specialists. Yes, as you can tell by the grey skies, we have not been whisked abroad. This garden was the winner of “Best in Show” and it was easy to see why. 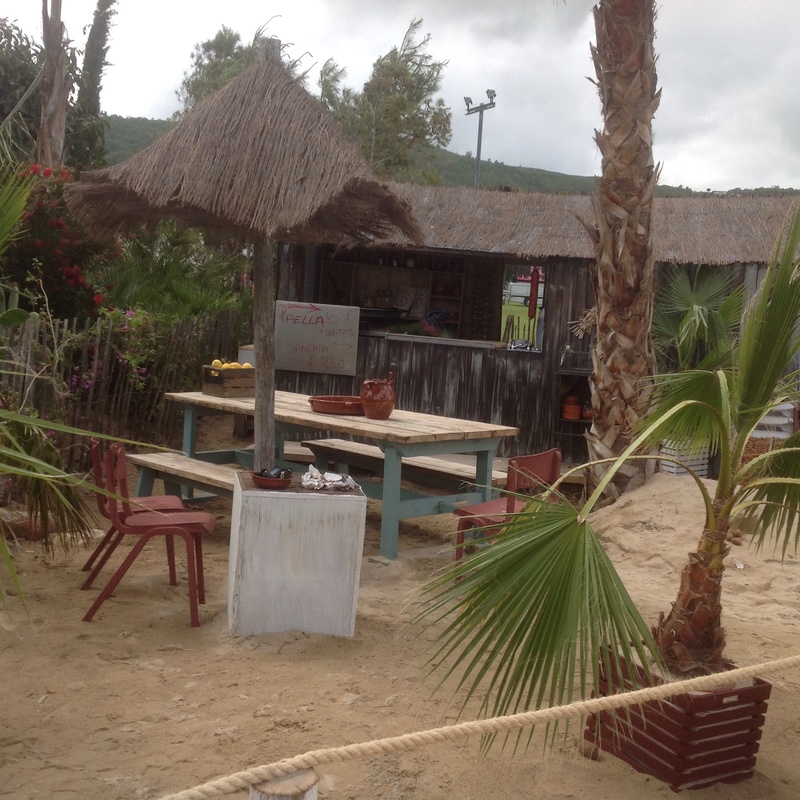 The attention to detail was incredible – so much so, that the beach hut was actually selling paella! All it needed was a bit of sun and blue sky, and you could think you’d been instantly transported! Now, this was another of my favourites. The next best thing to being transported abroad, by the previous garden. Named “A Fruity Story” it showed how a productive garden, complete with fruit, herbs, and salad crops, could still be a relaxing and entertaining area. 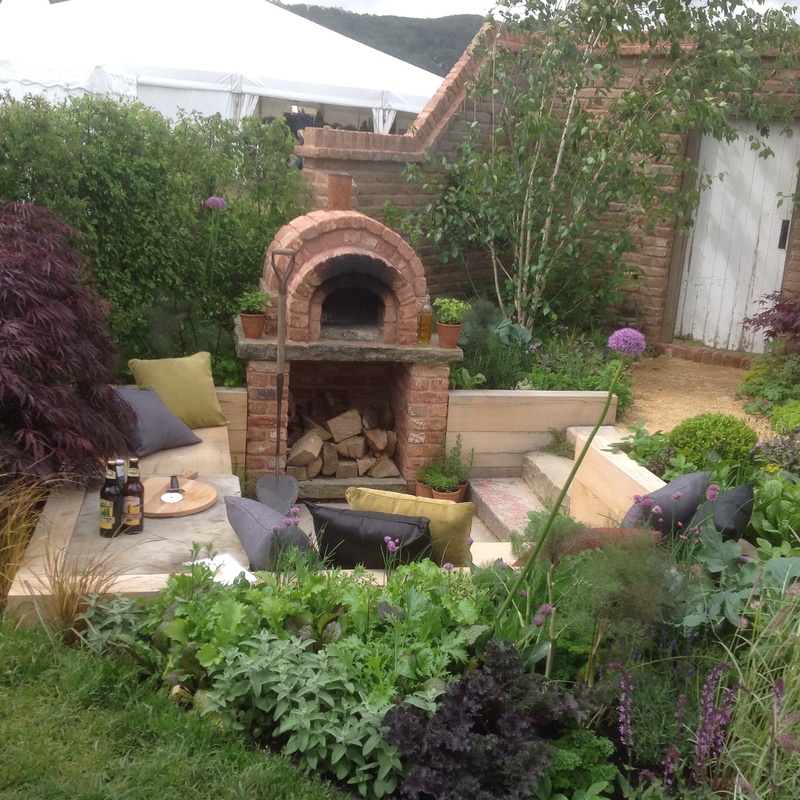 I loved the intimacy of this sunken seating area, complete with pizza oven (which I’ve more than dropped hints about, I’ve made a direct request for! One can dream!) and comfy cushions. I would certainly love to have this in our garden! This was the “Blush” garden, designed as an urban retreat, for relaxation, with a soothing colour palette of brown, pinks, and purples. I’m interested in your opinions! I know mine! 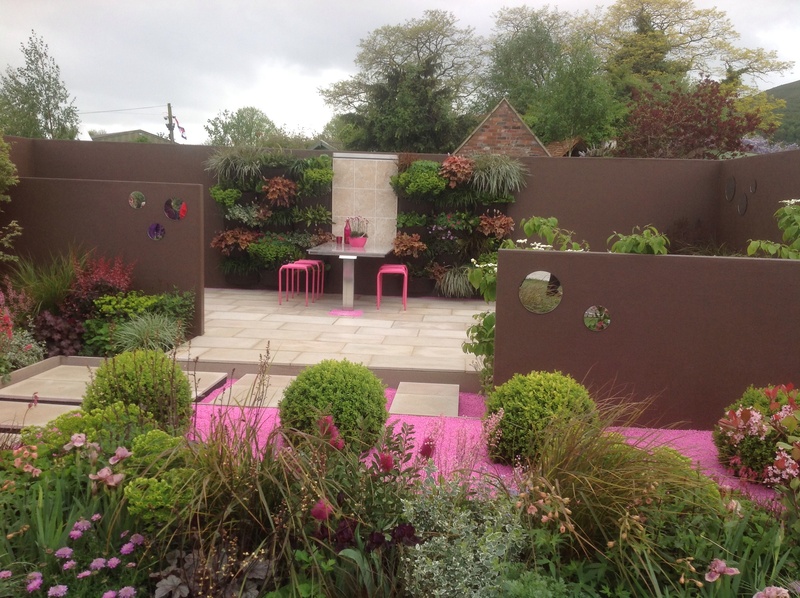 While it was a very well designed and imaginative garden, and the planting was sumptuous, it was too pink for me! Pink in the garden looks best in the flowers! But it definitely made you notice! By now, it was time for refreshments, so off to the Food and Drink hall. Once fed and watered, our shopping began. What epicurean delights were there! Our bags were full of sausages, smoked and marinaded meats, Welsh Oggies(which we’d never sampled before – a cross between a Cornish pasty and a Forfar bridie!) and to round it all off, chocolate flavoured with botanicals, such as violet flowers and orange peel with chilli! At last it was my turn, and back to the Floral Marquee for a serious foray. Of course, I left with some new gems! Goes without saying! 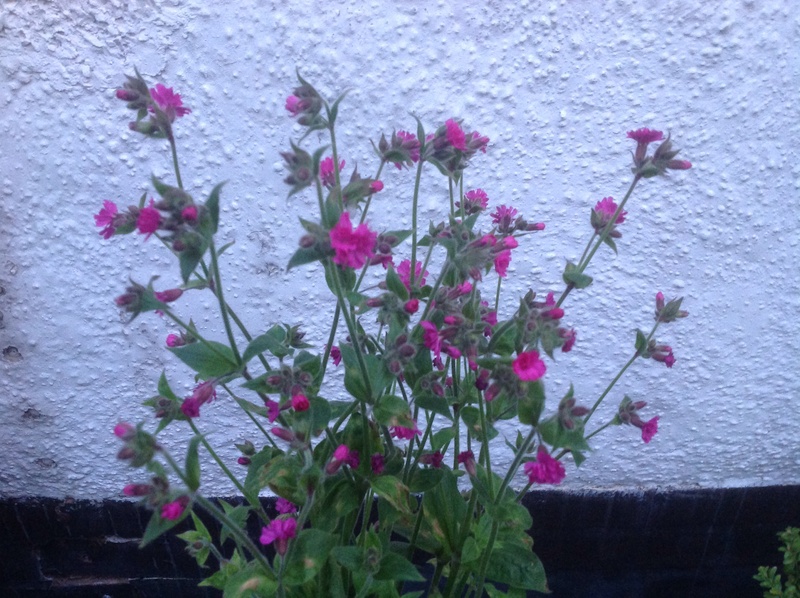 I came back with Viola “Molly Sanderson”, a beautiful black one, for my cottage border, another Stipa gigantea, and a new one to me, Silene dioica, “Firefly”, a double form of the wild red campion, with beautiful magenta pink flowers. Should look wonderful in among grasses. And it was much admired, on the way home. Boy were we tired, but happy! Enjoy your hopefully, sunny weekends! This entry was posted in Uncategorized and tagged Garden design, Garden show, show gardens, Silene, stipa, viola on May 16, 2014 by thelonggardenpath.